Smelly Lamb No More: Welcome Colorado! I have never been a big fan of lamb. I love a slow braised lamb shank in the winter with lots of tomatoes and herbs, but never seem to enjoy lamb chops or lamb loin. It is always served too rare for me, and I can't stand the smell. Is it just me? I do have a very sensitive nose. Every time I cook lamb in my kitchen, it stinks and I have to turn on the fan for 2 days. While mentioning this to my food psychologists Peter and Stephane at a blogger dinner, they suggested I try American lamb, such as Colorado. They sympathized with me and knew exactly what I was talking about. So, I wasn't crazy after all. Nothing against the New Zealand lamb that I have bought in the past, but this Colorado lamb made such a difference to my nose! So far, I have made lamb twice this spring, with much success and no strange odors! Here is a nice recipe from the June issue of Food & Wine. 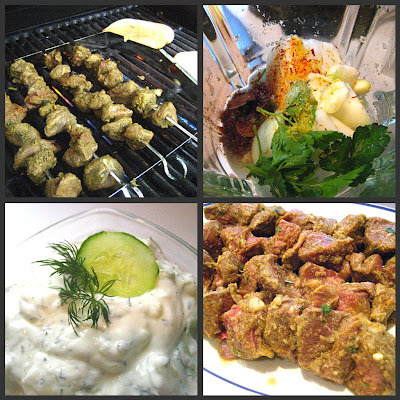 The recipe is for Middle Eastern lamb skewers served with grilled pita and a yogurt sauce. I used butterflied Colorado leg of lamb instead of the lamb shoulder. Cubed it and marinated overnight in a ziploc bag. 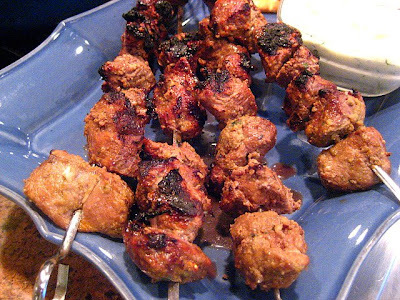 The allspice, saffron and onion juice makes this a unique marinade and made the lamb extremely tender & caramelized on the grill. Served with Peter's tzatziki and pita bread, this was one great dinner! Ya know - I've never tried to do lamb at home - it's a bit too gamey for me. I'll dibble on a few lamp chops here and there - but nothing overly fantastic. I'll definitely need to check out this recipe. I am with you on the smell. Thanks for tip about Colorado lamb. I have been wanting to make some lamb chops and a leg of lamb and now I have a little more motivation. Stace, so happy you found a good source of lamb for your tastes. As you said, nothing wrong with the gamier lamb but to each their own and this Colorado lamb sounds 'mellower' like our Ontario lamb. I love lamb chops but when it comes to roasted leg of lamb, I find the best way to avoid that "gamey" smell and taste is to trim almost all the fat away - and marinate for a long time - even as much as three days. I made a boned and butterflied leg of lamb on the grill with tzaziki a couple of weeks ago that everyone loved - although it was too rare for you. Your kebobs look great and the spices sound unusual. You are totally the opposite of me, I am all about lamb. I rarely cook any beef, my choice is always lamb, I love it so much! I will look for this Colorado lamb. Your lamb kabab, look really appetizing Stacy! I never buy New Zealand or Austalian lamb but I love the Colorado kind. Sometimes it is hard to find but when I see the US kind at Shoprite, I stock up the freezer. Perfect dish for a great weeknight meal. I don't eat or cook a whole lot of meat, but I've always thought if I go back to red meat I might like lamb more than other options. It always looks delicious. I'll have to remember to try CO lamb. Great Idea. I didn't realize that there was a difference in flavor. Great recipe, too! I am with you...I don't like the smell of lamb but I also don't like the taste. The tzatziki looks really good. I still don't know that taste which so many people refer to as "gamey" or "fishy". After all, what is fish supposed to taste like if not "fishy"?! I love strong flavored foods and love lamb, but am glad you found one that appeals more to you! You know what? I love eating lamb, but the thought of the smell always put me off cooking it! I'll try this tip and hopefully I can enjoy it more often! I know lamb has never been my friend, I can't get into it. But I always try it thinking, this will be it...maybe Colorado is for me. & CO lamb is more eco friendly since you aren't having it shipped from overseas. I have the same kind of reaction with ewe/goat cheeses. The smell of the oily coat seems to pervade even their dairy productions. Yuck.